Background/Purpose: Eosinophilic granulomatosis with polyangiitis (EGPA) frequently pursues a refractory course leading to high glucocorticoid exposure and toxicity. A previous retrospective study found rituximab (RTX) to result in remission in a proportion of patients with refractory and relapsing EGPA, but the observation time was limited to 12 months (M) and the report focused on response to a single course. We aim to report a two years evaluation of RTX efficacy and safety in a cohort of EGPA patients with relapsing or refractory disease. Methods: Retrospective analysis of single-center cohort of EGPA patients who received RTX and standardised data collection of baseline clinical characteristics, disease activity (Birmingham Vasculitis Activity Score (BVAS)), eosinophilia, prednisolone (PDN) dose and serious infections over the two years from first RTX treatment. Remission was deﬁned as a BVAS of zero and partial response as a ≥50% reduction in BVAS compared with baseline. Relapse was an increase in BVAS and in PDN dose ≥5mg/day or institution of i.v. corticosteroids or new DMARD. 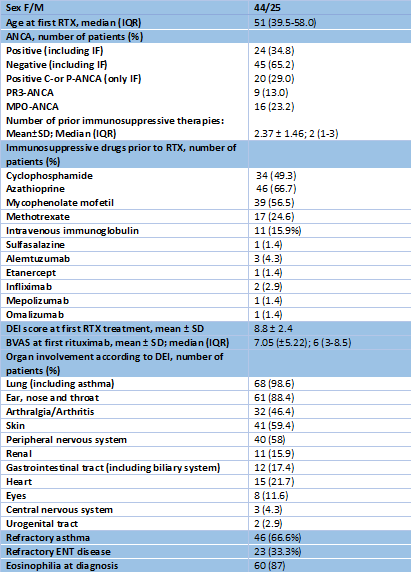 Results: 69 patients were identified and 54 received > 12 months treatment (Table 1). 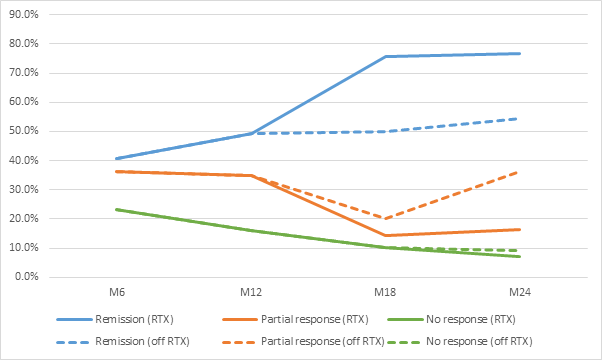 Remission at 6 and 12 months after RTX was achieved in 40.6% and 49.3% of patients, respectively, and increased at 18 and 24 months in those patients who received repeat dose RTX (Figure 1). Median time to remission was less in the ANCA positive group. RTX led to a median decrease in the BVAS of 4 at 12M and of 6 at 24M (p<.0005). At 12 months there was a median decrease of 5mg/day in the PDN dose and of 7.25mg/day at 24 months. No differences were found in eosinophilia. During treatment, 53.6% of patients relapsed at least once (mean 0.9± 1.27 (SD) relapses/patient). Relapses were mainly driven by asthma (Table 2). 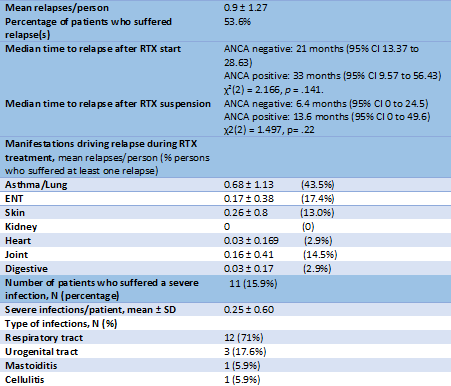 Median survival time to relapse after RTX was less for ANCA negative patients. Severe infections occurred in 15.9% of patients during treatment, mainly derived from the respiratory tract (Table 2). Conclusion: RTX led to overall decreases in disease activity and prednisolone requirements in our cohort with additional benefit from repeat dosing over 24 months. However, fewer than 50% achieved stable remission and the relapse rate was high, driven mainly by asthma. The risk of severe infections was consistent with previous studies of refractory vasculitis. Disclosure: V. Teixeira, None; A. Mohammad, None; D. Jayne, None. Teixeira V, Mohammad A, Jayne D. A 24 Month Analysis of Rituximab Safety and Efficacy in Eosinophilic Granulomatosis with Polyangiitis [abstract]. Arthritis Rheumatol. 2018; 70 (suppl 10). 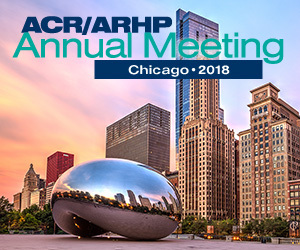 https://acrabstracts.org/abstract/a-24-month-analysis-of-rituximab-safety-and-efficacy-in-eosinophilic-granulomatosis-with-polyangiitis/. Accessed April 22, 2019.